Bear senses that winter is coming soon. So he gathers leaves and bracken just as his papa showed him and he catches silvery fish just as his mama showed him. Then one day he sees another young bear. Together they eat fish and berries and go to the den he has prepared and go to sleep. In the spring, they wake up and leave the den. Following them is a brand-new bear cub. They teach him how to fish and find berries and sweet honey. 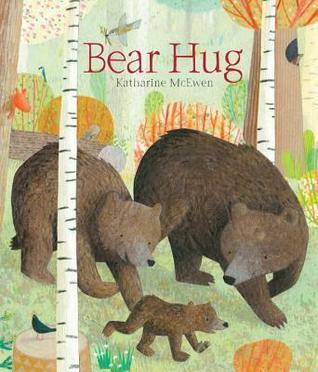 The bear cub grows and when winter comes again, they all return to the den and sleep in a big bear hug. Katharine McEwen tells a story with vibrate language and pictures. It’s a quiet, lovely story that children of all ages will enjoy. I love this new book! It’s a perfect bedtime story or anytime story. It’s definitely one I want to read again and again! What a sweet story with such a warm and loving feel to it. I think kids adore bear books. I love the group hug at the end. What a great way to send a little one off to dreamland!